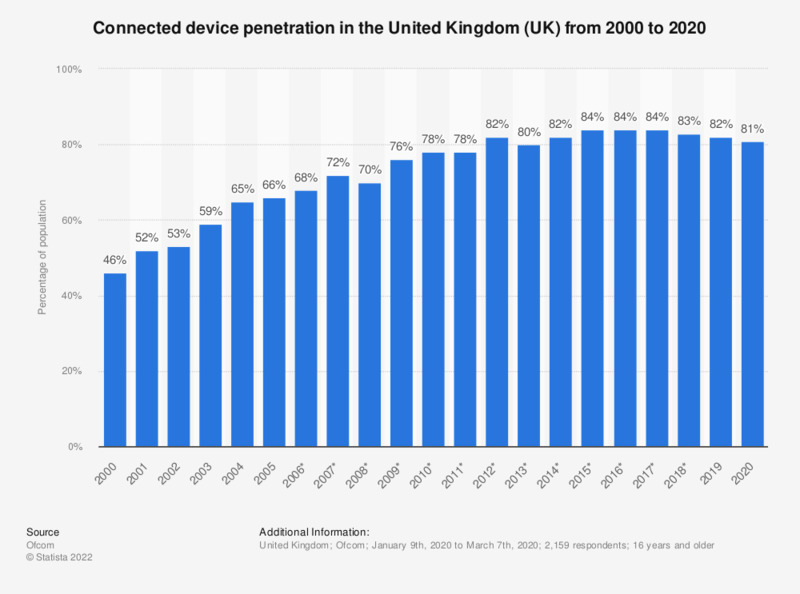 This statistic presents the connected device ownership in the home in the United Kingdom (UK) from 2000 to 2018. 2014 has seen an increase in the penetration of devices able to connect to the internet i.e. PCs, laptops or tablet computers. In the UK, 82 percent of adults owned at least one connected device in 2014. That share increased to 83 percent in 2018. The use of connected devices in households is becoming a trend, and the number of connected devices per person was high among respondents from the UK. In addition, there were many smart home devices such as smart thermostats or smartphones. * Note: Data for 2006-2016 based on Q2 data, all other data based on Q4. Data for 2000-2010 refers to PC or laptop computers. Data for 2011-2013 also includes netbook or tablet computers but not smartphones. Data for 2018 only includes Q1 data. During the survey, this question was posed as follows: "Does your household have a desktop PC, laptop, netbook or tablet computer?"